SHENZHEN, China, March 25, 2019 /PRNewswire/ -- SKYWORTH ranked first in China in both sales revenue and sales volume of televisions in a recent report by Aowei Cloud Network (AVC). 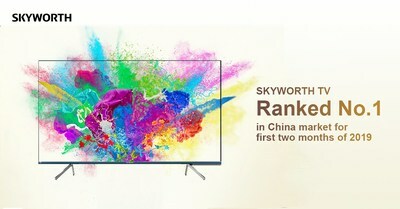 According to the AVC Color TV - Monthly Omnichannel Analysis Report for China's Color TV Market, SKYWORTH's overall retail sales in the TV market amounted to 1.35 million units in the first two months of 2019, making it the best-selling brand in China among both domestic and international TV brands. SKYWORTH's retail sale shares, ahead by 145,000 units, reached first place with 15.8% in China. In the first two months of 2019, the total retail volume of the color TV market dropped by 0.5%. Amidst the overall industry downturn, SKYWORTH's TV sales have sustained growth momentum, recording a rise of 11.3% year-on-year. According to the Q4 2018 sales report issued by AVC, with an impressive sales figure of 14.8%, SKYWORTH was the No.1 performer in terms of sales volume across all channels in Q4 2018, and has kept momentum in 2019 with the highest sales volume over the past two months. "We are thrilled to see how SKYWORTH has commenced 2019 with such remarkable and vibrant results. Strong sales figures are always the best testament to our products, this year we are determined to bring more innovative TV products to the market and continue self-improvement with the new brand strategies," said Tony Wang, Chairman & President of SKYWORTH TV. SKYWORTH Digital Holdings Limited (HKG: 0751) is a leading supplier of uniquely advanced and affordable technology solutions. It is valued in excess of US$ 19 billion and employs over 40,000 people worldwide (as of 1 March 2019). Headquartered in Shenzhen, China's 'Silicon Valley', SKYWORTH offers consumer electronics, display devices, digital set-top boxes, security monitors, network communication, semi-conductors, refrigerators, washing machines, cell phones and LED lighting. Founded in 1988, it is one of the Top Five Color TV brands in the world and a top brand in Chinese display industry market. It is also a Top Three global provider of the Android TV platform.